Home / Extra-Curricular / Valentine’s or Anti-Valentine’s – You Choose…. All that love stuff at Valentines: well, the Persians are partly to blame you know. 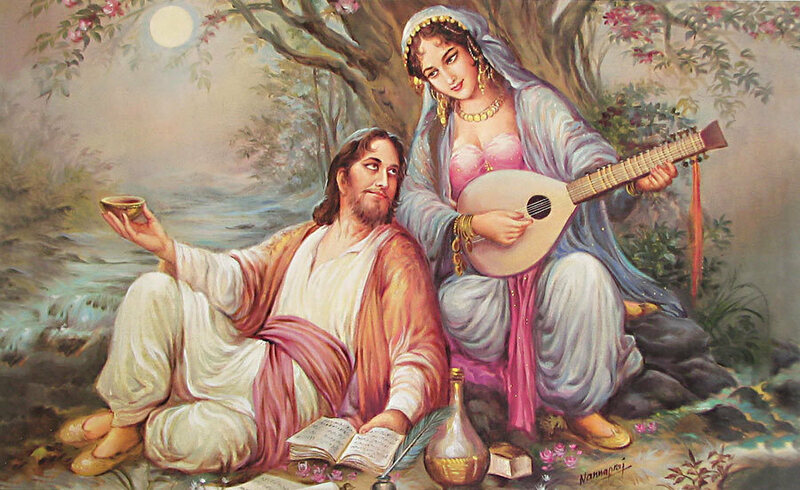 Tomes and tomes of early Medieval Iranian poetry – Omar Khayam and Hafez and co – gave birth to the Western concept of courtly love and romance. So it’s only right that we mark 14th February. But in our own style, natch. We’re giving you no less than two special events for Valentine’s Day this year. Firstly at the Cinnamon Tree Bakery we will be offering an Anti-Valentines repast. No roses, no schmaltz, no lovey-dovey music, and bookings for 3 or more are positively encouraged. The menu for this option is below: as usual it will cost £35.00 a head and the price includes a complimentary Persepolitan cocktail on arrival. A £10 a head deposit will secure your reservation: call 020 7639 8007 to book now – or call in. And then in the shop we will be featuring a slightly more loved up menu. There will be roses. And drippingly romantic Persian crooners on our sound system. And candles. We will be offering a £20.00 a head vegetarian meze special menu featuring a range of platters, hot and cold (you’ll have to trust us as the menu won’t be determined until the day). The meal will finish with rose sorbet and Mrs.S’ secret-recipe amorous tea. Persian lime-marinated chicken served with havij pulao – saffron rice with carrot and sour orange peel. Veggies get to enjoy the same rice but with a watercress and butter-bean vegetable sauté. Please bring your own booze. Or not. As you wish. Delicious food, lovely event. Enjoyed the many dishes, exquisite flavours. Historical and cultural delightful interjections during proceedings completed the evening. Thank you.